Originally entertaining the dignified members and notable visitors of Club Francés, a community of prominent French-born residents of Buenos Aires, Hotel Club Francés Buenos Aires is a distinguished establishment reminiscent of a Parisian townhouse commemorating its dynamic history symbolizing the French and Argentine alliance. Built in 1866, Hotel Club Francés Buenos Aires maintains its refined and classic style without sacrificing its heritage, blending elegant Belle Epoque furniture with modern conveniences. Once host to renowned national and international political and cultural luminaries, the grand hotel translates the opulence of its past into 28 beautifully-appointed guestrooms and suites, ornate meeting rooms furnished with marble fireplaces and exquisite chandeliers, luxurious amenities, and gracious service. A symbol of a cultural and political union, Hotel Club Francés Buenos is a sophisticated experience lending a splendorous ambiance at an elevated caliber. 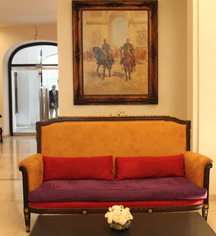 Hotel Club Francés Buenos Aires, a charter member of Historic Hotels Worldwide since 2013, dates back to 1866. Club Francés quickly flourished in the elite social circle and was visited by luminaries of the art and business world, including recipient of the Noble Prize in Literature, Anatole France, and acclaimed Spanish politician and journalist, Vicente Blasco Ibáñez. Hotel/Resort Fees & Taxes: All citizens of Argentina will be charged the national value-added tax (21%) upon check-out. Foreigners on a tourist visa are exempt from this tax. To qualify for a tax exemption, tourists must present a valid passport and pay for the services rendered with a non-Argentine credit card or via bank transfer from another country. This tax exemption does not apply for stays over 90 days. Parking: On-site parking; Not Available. Originally entertaining the dignified members and notable visitors of Club Francés, a community of prominent French-born residents of Buenos Aires, Hotel Club Francés Buenos Aires is a distinguished establishment reminiscent of a Parisian townhouse commemorating its dynamic history symbolizing the French and Argentine alliance. 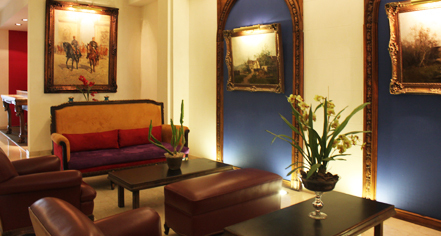 Learn more about the History of Hotel Club Francés Buenos Aires .